We do not collect information from visitors. Newsletter sign up is through a form on our Contact Us page. We do not add purchaser information/names/emails to our newsletter list. It is an opt-in only list. For those who choose to opt into receiving our newsletter, be assured we do not sell, loan or rent our mailing list. The mailing list is used solely to present DyakCraft LLC products, specials and news to those interested. A link to unsubscribe is at the bottom of each of these emails. Purchases via the DyakCraft LLC website are finalized through PayPal's secure shopping cart system. We do not receive credit card information from PayPal. We collect our customers' names, addresses, emails and phone numbers at time of purchase. This information is used solely to process orders from DyakCraft LLC. Orders generally ship within a week. We are usually quicker than that, but for those times when we have special items or offerings and a lot of activity, that can extend to 7-8 working days. We ship via USPS First Class Mail, Priority Mail, and USPS First Class International Mail. The Screw Came out of My Needle! If this happens, don’t panic! It’s a simple fix. Put a drop of Superglue on a plastic lid or a card, lightly tap the end of the screw into the glue, and insert it into the needle. If any seeps out, wipe it clean immediately. If the thread is still in the cable, once the glue dries, unscrew the needle and you are good to go. That’s it. It’s that easy! 1. Remove the screw from the connector if you can (a piece of rubber band helps.) It isn’t necessary, however. 2. Place a drop of Super glue on a surface. 3. Tap the screw into the glue. It only takes a tiny bit of glue. 4. Insert connector with screw into the needle, wipe any excess away from the connector if it is still attached, and you are good to go! 1. Push the cable through the wide/threaded end of the connector. 3. Squeeze the end lightly. You can use tweezers, pliers or whatever is handy. Running hot water on the end of the cable makes it much easier. 4. Pull the cable back up into the connector and make sure it is crimped enough to stay up in there and yet able to rotate. If it is too wide, trim the edge of the crimp.The Heavy Metal™ cables are so small that a tiny amount of pressure is all that is needed to flatten the cable just a bit. ​My needles keep coming unscrewed. 1. They are not tightened enough. Use a piece of gripper or a rubber band to tighten your needles. 2. Some knitters hold the working needle so that the end butts into their palm. This prevents the cable from swiveling and can unscrew the needles. My cable won’t connect to the needle. 1. There is dust in the threads of the connector. Blowing air into the connector will remove the dust. 2. The cable end is not all the way up into the connector. Tug on the cable. 3. You ordered and/or received the wrong type of cable for your needles. Please contact us. 4. Once in a blue moon, the connectors could be faulty. Please contact us. 1. The cable end is not all the way up into the connector. Tug on the cable. 2. The cable end was crimped too much. Push the cable through the connector and trim a bit off the crimp (nail clippers work great for this. 3. Some knitters will hold the working needle so that it butts into their palm. This can prevent the cable from swiveling. My nylon cable has a bend at the connector. 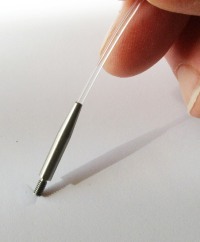 If you hold the working needle so that it rests up against your palm, the nylon cable can get overly bent. If it is long enough to spare a half inch, pull the cable through the connect, clip to the bend, and then crimp the end of the cable with pliers. It only takes a little pressure to crimp enough to keep the cable in the connector. I have one of the above problems, but I don’t want to mess with it. Repairs aren’t my thing. My DymondWood tip is cracked at the threading. One in 500 needles will have the glue line near the tip or the end of the needle. Most of these will never fail. We do our best to catch any that we feel might do so, but we can’t catch everything. We will replace the tip with a new pair for as long as we can. As our wood tips are made by hand, there are differences. For this reason, Tom will usually do tips in pairs only. For metal needles, we are happy to send just one.